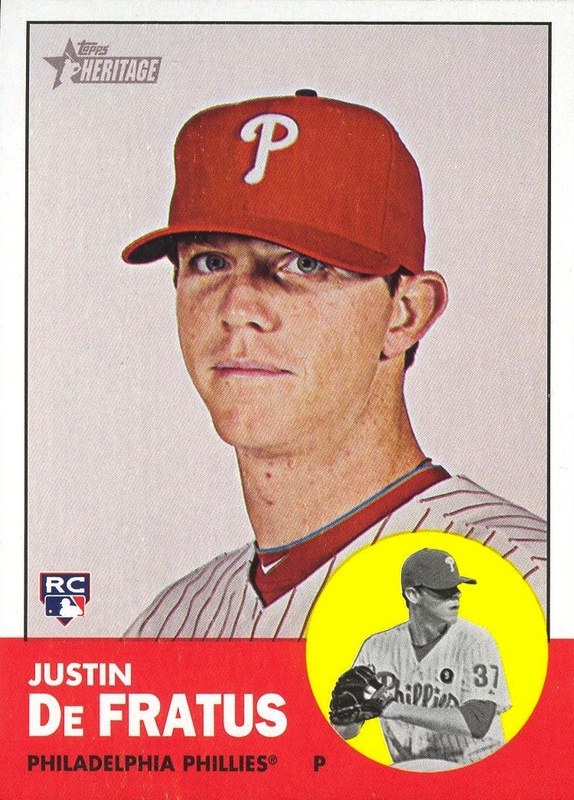 It gets worse: De Fratus also appears on 2012 Rookie Stars card #29 with Joe Savery, who makes a second appearance on 2012 Rookie Stars card #362. 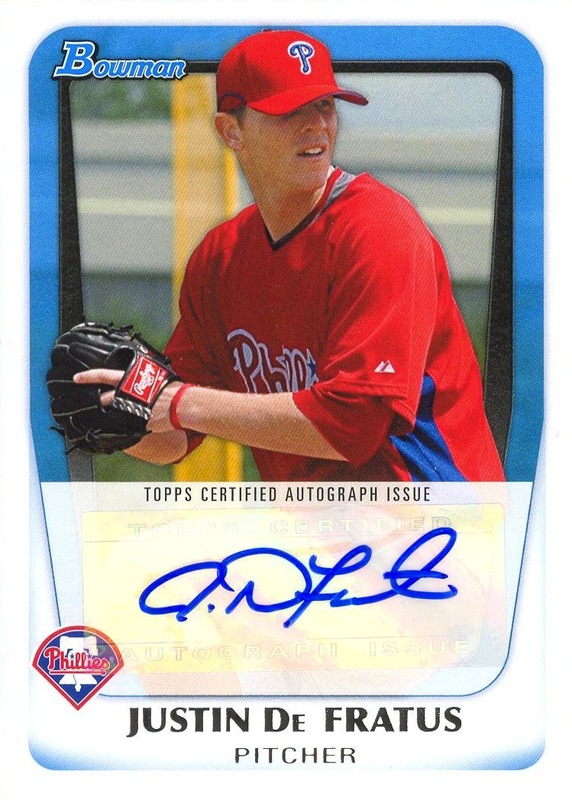 I realize that the Rookie Card Logo rule limits the prospects that Topps can place on these cards, but on the Phillies alone, Michael Schwimer was also available for use in this subset. I haven’t researched this, but I can’t help but feel that there were prospects from other teams eligible as well. 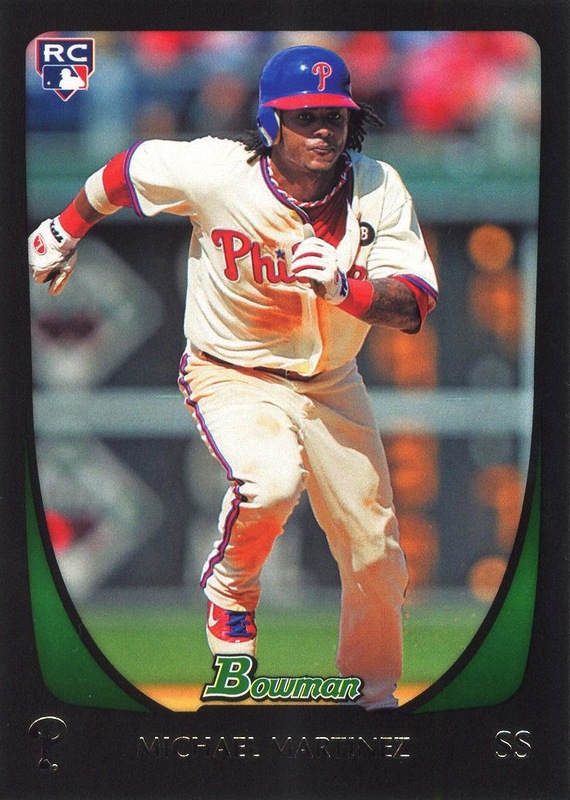 And if there aren’t enough prospects available to create as many cards in the 2012 Rookie Stars subset as Topps would like, then only make the cards you can. In a set this small — even with all the variations, there are fewer cards overall in this year’s Heritage than in the original 1963 set, which I think is a fracking travesty — there are always plenty of veterans, young players and bench warmers to choose from. Thank goodness I actually don’t actively pursue multi-team cards. Otherwise, Topps’s extreme laziness in this matter would really annoy the crap out of me. I’m still waiting for the “Master Team Set + Insert Cards” I purchased off of eBay to arrive, and I’d prefer to wait until I’ve had a chance to look at it before making sweeping comments about the new 2012 Topps cards. 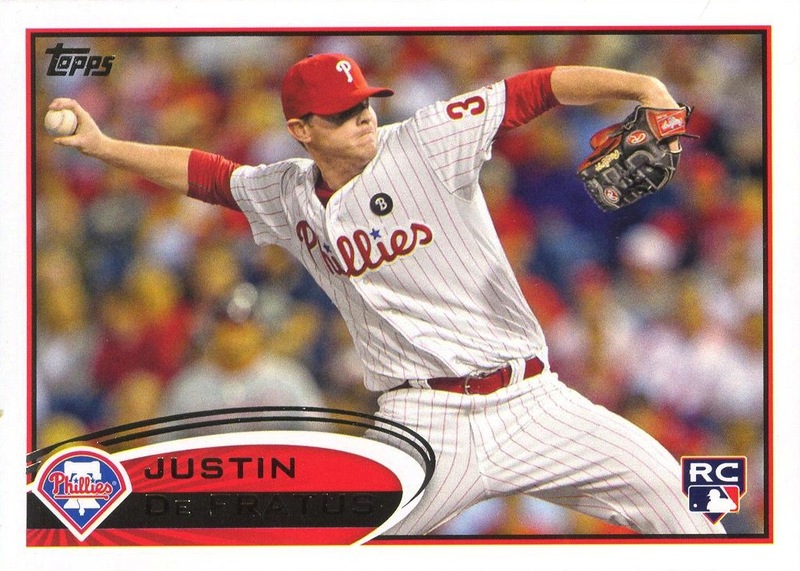 However, I did purchase a couple packs and ended up with the Michael Martinez and Justin De Fratus cards. 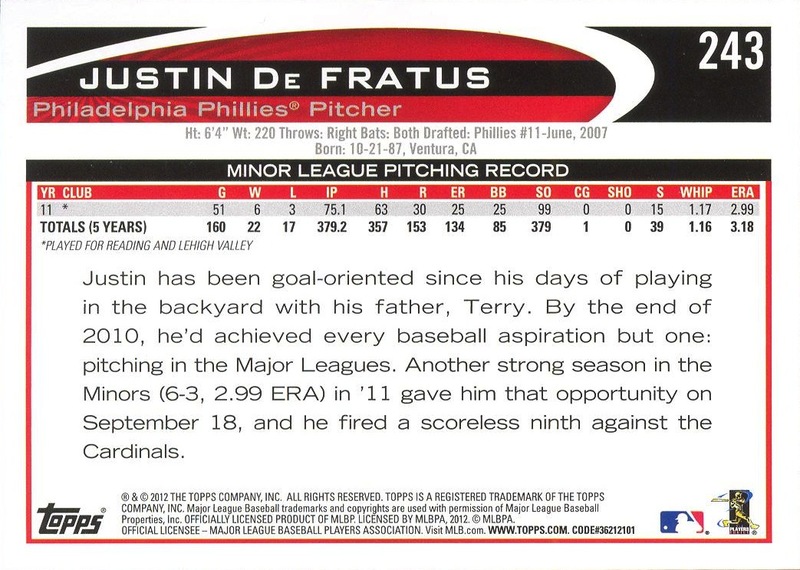 I have to admit to being somewhat disappointed with De Fratus’s “official” rookie card. First, the horizontal layout. In of itself, it’s a good photo and it works well in this format. 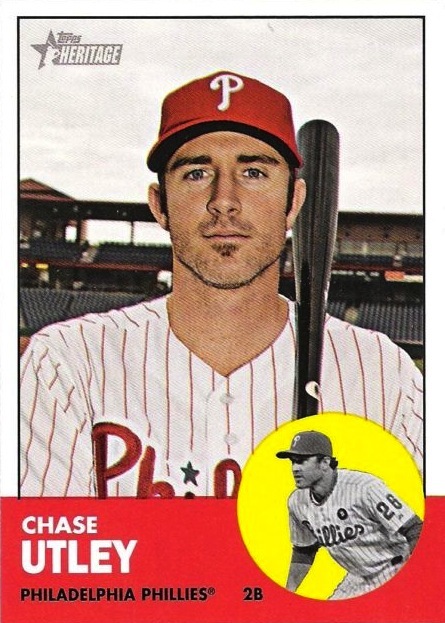 However, I really, really wish that Topps would stop mixing horizontal and vertical layouts within the same set. Do one, or the other; not both. Second, what’s with the summary of Minor League stats on the back instead of listing all five years worth? The line spacing on the text box makes it clear that Topps was not hurting for room for them. More disconcertingly, he did have Major League stats in 2011. 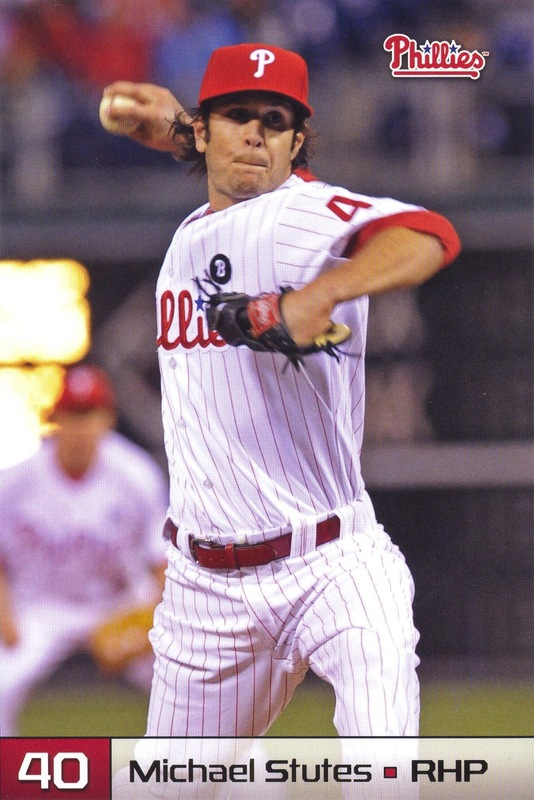 Admittedly, he only faced 17 batters over five appearances, but that doesn’t mean they should be ignored. It’s really a shame that Topps couldn’t be bothered to put together a proper back for the card. 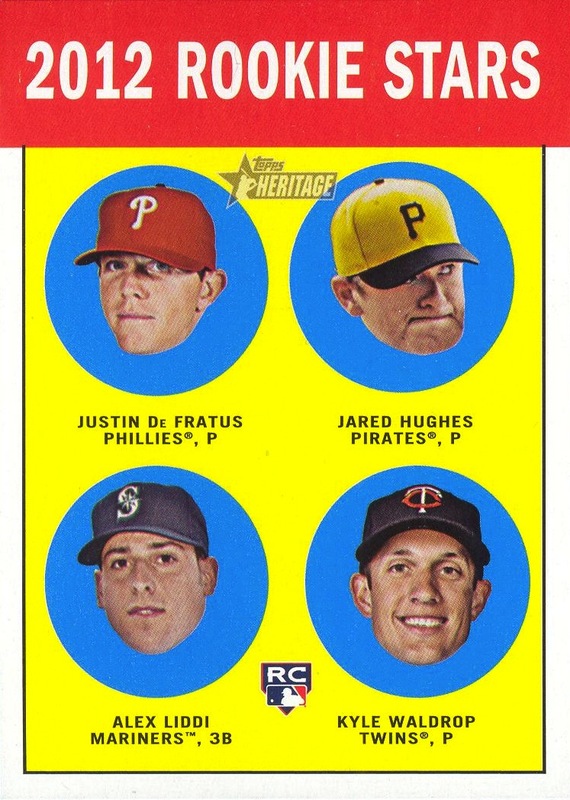 Overall, I have a positive first impression of the cards, but thanks to the De Fratus card, that impression carries a slightly unpleasant aftertaste.